Royal Shrovetide Football. Ashbourne, Derbyshire, England 1974. Annually Shrove Tuesday and Ash Wednesday. 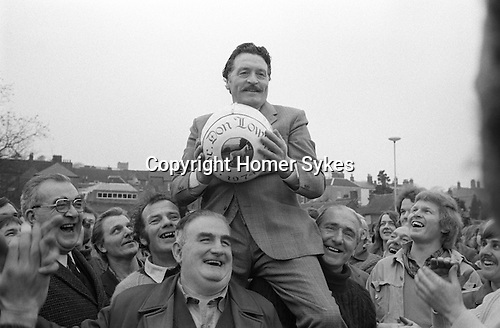 Mr Don Lowndes, Ashbourne resident and Turner-upper on Ash Wednesday 1974 is carried shoulder high through town by John Mansfield and Colin LeGrice, before the start of the Royal Shrovetide football game. At Shaw Croft the crowd sing Auld Lang Syne and God Save the Queen before Lowndes kisses the ball, and throws it up, to start the match.